Do you remember what it was like being a kid and not being able to fall asleep because you were so excited?! How you would lie in your bed starring at the clock wanting to fall asleep, but getting so excited that you couldn’t possibly close your eyes for more than 2 seconds at a time. And it’s all about what percentage of my pay should I save for retirement? That’s how I’m feeling about what I’d like to share with you today. One of the things I love to do is think about numbers. I know you’re probably thinking “NERD!”, and in all truth, I guess I am (but my mom says I’m handsome, and really that’s all that counts). As we have been coming up with our newest 5 year Money Plan our focus has been to start saving half of what we make. In playing with this retirement savings amount, I have found some crazy motivation for saving more money. I nkow FIRE is the big word right now. IT means Finanical Independance, Retire Early. For us that’s not enough. Looking to the future we want to leave a legacy. Ideally, we want a retirement that would allow us to retire, without ever touching our principle (i.e the amount we have saved up). To use a nursery rhyme metaphor, it’s the idea of living on the eggs from the golden goose, not the goose itself. There’s a ton of retirement calculators and no matter where you are in the world, your situation will be different than anyone else. Honestly, after a while, your head starts to spin. So I decided to boil how much you should save for retirement down to a simple concept. The more you can save today, the more you have for later on. Which means we live off the other half (kinda obvious), but keep reading, I’m going somewhere with this. This concept of saving is pretty simple. Live off less, means you save more. If you live off half your income, then the other half you saved could be used for expenses in the next year without needing to work. So that means after one year of saving, we will have one year where we could live without earning. Think of it like a mini-retirement. In theory, we could work one year, and get one year off. That’s pretty cool and a good incentive to save half. If you only save the recommended 10% that means you are spending 90% of your income. It will take you 9 years of saving instead of 1to save a full year of expenses. (not counting inflation and all those fun things). So when I saw this I got excited. Really really excited. If we save half, then we speed up our retirement timeline by decades. We all know the more we save the better it is for us. But when you look at it like it is below you can see why saving more makes more sense. If you Save 5% of your income, then it will take 19 years to save up one years worth of expenses. If you Save 10% it will take 9 years to save up one years worth of expenses. Save 20% and it’s taking 4 years. Save 25% and it’s taking 3 years. Save 50% and it takes you 1 year of working time to save up one years worth of expenses. Save 75% and 1 year of saving gives you 3 years of living expenses! That’s pretty cool, 75 % is not the easiest thing to do but it could be doable if you are willing to make some new choices. As a numbers person, I just want to share this in a real world examples. Let’s use a household that takes home $60,000 a year. Let’s simplify this and say we live off half. So for every year we live and save half of our income, we get a freebie year (i.e. a year where we don’t have to work because we have saved it up from the previous year). Great for retirement, or at hitting your freedom point where you can walk away from your job. So what happens if we banked all those extra years off? If you save half of your income for 20 years and get a 5% return you can retire and live off the 5% interest with all of the principle being untouched!!! Of course, this doesn’t include things like taxes, inflation and other variables. It’s pure numbers, and it looks good to me as a starting point. Especially since I’m pretty concerned about retiring early, doing so makes me want to make sure I don’t touch my savings and live off the interest only. If you are looking to draw down capital there is more to it than this. I really like this way of looking at it. Because this focus places everything in your hands. If you can live off less you can retire faster. It’s pure and simple. It’s probably basic for a lot of people but for some reason, this really clicks with me. While it’s probably not feasible for many of to live off of 25% of their income, I’m finding a new motivation I never had before. Sure 5% interest may seem high right now. Historically interest rates have been around 6-8%. We are just living in unprecedented times. Assuming rates will stay low forever is like assuming you will never get old. It’s going to happen, a little bit at a time. Rates are already starting to creep up so it might be here faster than we think. I know I heard that voice too. Start looking for ways to earn more money. As for us, we are going to aim for saving 50% and start working towards an earlier retirement. I have no clue if we will get there, but it’s going to be a fun ride along the way. I think one part you missed in the 50% saving (30K per year) is the return your savings will generate over the years of saving. If you assume that you get 5% per year even during the years of savings, and you save 30K per year, you will reach 600K in little less than 14 years (compound interest). So, if we save 50% or more, we just need 14 years to be financially independent and not 20 years. That is certainly enticing. I’m doing a hard push into the make-more-money arena as I generally get better results that way instead of cutting things back too hard (just how my personal motivation seems to work), though I do make various cyclic cuts also. 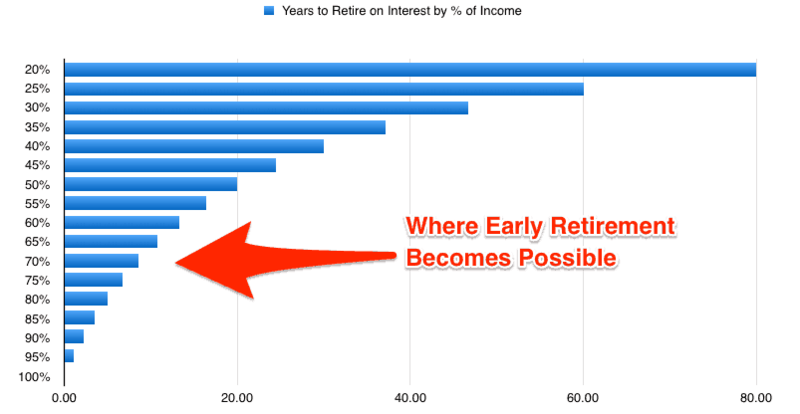 Seeing how those different amounts impact the ability to retire early certainly gives an interesting additional perspective. Sometimes, nothing says it better than a graph. As a nerd I love graphs. Way to go on looking at the make more money avenue, I’m starting to look at it more myself. There are tons of options it’s a matter of picking something that resonates with me. I love the idea of cyclic cuts. Reminds me I need to go back and look at a bunch of things and see if anything can be trimmed. This is certainly motivating. I’m a numbers nerd, too, so this is interesting stuff for me. I’m just about to start tracking my savings rate, haven’t dug in yet. I know I’m starting at the low end but by tracking it and focusing, I’ll be able to improve it. Given that I’m just starting to finally think about more actively saving for retirement, I found this post really motivational! I’ve never had a job that had benefits, so I keep reminding myself that I need to do more re: retirement planning & this post did a great job of making a clear argument for that. Thanks! Hi Heather. I’m happy you liked it. The earlier you can start thinking about retirement the better off you will be. Good job in thinking more about it!